These are tips from other stroke survivors regarding treatments or activities that they have found helpful. It is not meant to be medical advice. Check with your MD or other healthcare provider to find out what treatment is appropriate for you. Join in and write your own page! It's easy to do. How? Simply click here to return to Recommendations for Stroke Treatment and Rehabilitation from Stroke Survivors. 1. Don't consume unnecessary fat. One reason why stroke happens is because there is no oxygen getting to the brain. If there are fats covering the veins, it would be hard for oxygen to travel through them, and thus stroke is very likely. 2. Be active. It helps to strengthen your heart and veins. The cardiopulmonary system is responsible for pumping blood around the body, and with that blood comes nutrients and toxins. Flushing them out efficiently while supplying the needed nutrients in various areas of the body as quickly as possible will help prevent any problems including stroke. 3. Avoid too much heat. Some people have stroke because of the sudden changes in the weather. If you feel that it is too hot, you might want to stay inside and change to comfortable clothes. Hydrating your body properly also helps. 4. Coordinate with a neurologist. Even if you haven't had a stroke yet, there might already be a clog inside your brain, and it may only be a matter of time before you experience that dreaded stroke. Instead of waiting for it to happen without being prepared, you can have yourself examined by a neurologist. Tests can show whether or not there are abnormalities inside your brain. 5. Do not disregard severe migraines. One signal that there is something going on in your brain is when you are always getting incessant migraines. Especially if it lasts for hours or days on end, you might want to have a doctor check it out. It's better to be sure than sorry. 6. Eat foods that help burn fat. Everyone is encouraged to eat their share of vegetables. Furthermore, a daily serving of coconut oil might also help your body metabolize, plus it has been proven to be good for the heart. There will be decreased chances of developing stroke with this healthy addition to your diet. Sometimes a person is already undergoing stroke in front of you without you noticing it. Try to ask someone to smile, stick out his tongue and raise his left and right hand. If he can do it without fail, it means that his brain is still functioning properly and he is not having a stroke. Alesha Wilson is a staff writer at RockwellNutrition.com, leading natural health website. You can get Rockwell Nutrition discount coupon codes by following the link. I work in the medical field and I have seen the struggles and hardship strokes can bring. I have found that hyperbaric oxygen therapy can truly help someone with any kind of neurological injury or disease. I have made a strong effort to help people understand and receive this information regarding this therapy. The combination of pressure and increased oxygen can do wonders for allowing the brain the repair itself and help stroke victims regain physical and mental abilities they had lost. We have a created a free website listing hyperbaric clinics and facilities nationwide. This can truly help bring life back to a normal state. Our site is www.hyperbaricnation.org. I hope this can help someone who is dealing with the issues stroke can cause. What is your website listing the Hyperbaric clinics in the United States ? Judo hand exercise where I closed and then opened my hand helped it work. I then raised my arm to horizontal and closed and opened my hand repeatly until I could do it 100 times at a time. I hope this helps others. by MARK A. ITTLEMAN, M.S. Are you tired of gimmicks, worksheets, software, or boring one-hour sessions reciting lists of words? In my clinical practice as an expert speech-language pathologist for the past 40 years, I have seen hundreds of frustrated patients and family members who have said those very words to me. I, too, was tired of programs that didn’t bring success to my patients. I knew there had to be a better way, so I began treating my patients differently. I put the gimmicks and worksheets and software away, and I began talking with them about things they were interested in. Imagine that! I learned that people speak much better when they talk with another human being about things they are interested in, instead of a computer screen! Our book. The Teaching of Talking is currently being published in New York. It is a totally new concept in speech therapy. Within its pages you will find refreshing, and revolutionary speech therapy methods that will rock the world of someone you love. We believe speech therapy and speech and language stimulation are best done in the home, by family and caregivers, under the supervision of a licensed speech-language pathologist familiar with the methods contained within The Teaching of Talking. If you have ever taught a toddler to speak, you will quickly see why our method works when others fail. We begin slowly, with simple “yes” and “no” questions and one-word answers, and we talk with the person who is learning to speak again all day long, through all of the activities of daily living. Sound familiar? If you offer a toddler some milk, you ask him to “say ‘milk.’” Well, our method is very similar. As one-word answers begin to come easily, we expand to two-word phrases, and so on. The fact is that in today’s system, most people with mild to profound speaking difficulties will be discharged by the therapist or hospital/insurance company long before the need for therapy has ended. You no longer have to be bound to a speech-language pathologist, insurance company or management system that is going to discharge you soon anyway. 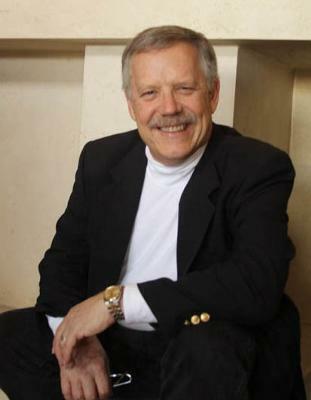 Take a proactive role in the speech and language stimulation of your loved one. Become a pivotal, active participant in your loved one’s recovery, not a passive observer, wondering if they will ever get better. So when the day comes that your loved one’s therapy is terminated or if they have been discharged, for whatever reason, you feel confident continually going forward with speech-language stimulation at home for as long as it takes to get clarity in speaking! I'm a physical therapist, and I just wanted to make you aware of a program of guided mental practice for stroke recovery, called Mental Movement Therapy. Research shows that mental practice is effective at stimulating neural "re-wiring" needed for recovery of motor control. 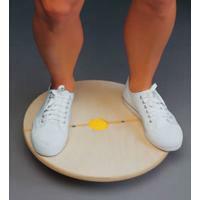 It's a valuable tool for people who have such little motor control that they cannot physically perform rehab exercises or movements without help. It's also a good way to refine movements, and improve precision and control. Research has proven it to be effective at "re-wiring" neural control areas of the brain, and improving arm and leg function after a stroke. 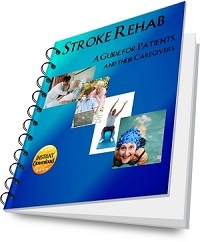 Note from www.stroke-rehab.com: Please note that submissions from others are for informational purposes only and are not professional medical advice, diagnosis, treatment or care, nor are intended to be a substitute. Always seek the advice of a physician or other qualified health provider concerning questions you have regarding your health or a loved one's health concerns. I use medicine and simple exercise for my arm & leg nowadays. I started exercises from your web page, and I feel better. Comment from Stroke-rehab Thanks, Tauqueer. I'm glad the exercises have helped. I have had 3 strokes and they (Rusk Institute of Rehabilitation) are the reason why I make so much progress. My girlfriend lost the use of her left side after her stroke in April. The therapy she received helped her leg, her speech,her eating and swallowing - just about everything but her arm and hand. This is what i would like to talk about. 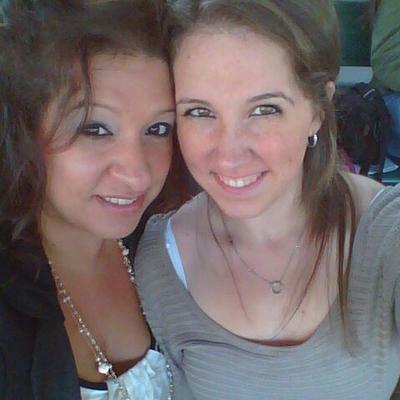 I have been by her side since her stroke. Every therapy she got I repeated it in her hospital room, and her recovery was amazing but they couldn't really do any thing for her arm (mainly due to the pain). I asked them about a sling to hold her arm shoulder joint in place(they said the pain and swelling was from pinched nerves in the shoulder). They said that she just had to work through the pain because there was no sling that really worked for the subluxed shoulder. My answer to that bull*&^%...I watched her therapist hold her arm in place and her pain went away. I started searching for a sling, and sadly they were right. Every sling I found caused more harm than good, and they wouldn't let me put any on her. Well, I didn't stop there. When she got home, she had in home care and I started making different slings while her therapist kept telling me what was wrong with each sling (made 10 kinds). Finally, they started liking where I was going with number 11. I finished it, and her therapist loved it. Her pain level dropped to where she no longer takes pain meds. The recovery of her arm jumped 80% in two weeks. Now all of her doctors and therapist require her to wear the sling I made. 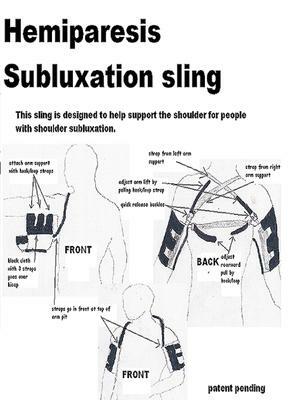 If you would like to see what I did, I put together a web page describing it https://sites.google.com/site/subluxationsling/. Maybe this will help someone else out. Yes, we started making my sling and offering to the public the price we charge barely covers the cost to make them. We(my girlfriend Sharon and me) make them here in our living room. It is great therapy for Sharon, and she feels better about her stroke knowing that what she has gone through is helping others with there recovery. I am from Chennai ,India. I am stroke survivor aged 46 male. I have really worked hard at post stroke scenario. My idea: Do yoga every day, it helps. Last March, I could not do yoga exercises. I resorted to doing exercises called pranayam. Now for the last 6 months I go for a walk. The average time is 45 minutes. Coupled with yoga, it has changed my life. Please seek a yoga teacher and go ahead. I encourage you in your endeavours to rehabilitate thru YOGA. I had a stroke in March 2010 where I was paralized completely on the left side of my body. I undertook intensive rehab: in the gym & after discharge walking slowly together with pool exercises. Currently my progress has been excellent with a strong faith and belief in GOD. I walk unaided, sometimes with a walking stick. My memory was not effected at all. I'm a stroke survivor at age 44 male. I would appreciate comments from individuals who are currently working with their wrist or have successfully rehabbed their wrist. my wrist is currently resisting any regimen designed to elevate the wrist with palm down or to supinate (palm up). Progress like all things stroke related take time and progress is measured in very little increments. have to change that now because you need the fiber that whole grains can provide. your body fight sicknesses, including another stroke attack. don’t feel the urge to go for that extra plate of fried foods. have had stroke are more prone to another episode. protein source, chicken and eggs, among others, can provide it. diet to take advantage of all of them. Alesha Wilson is a staff writer at RockwellNutrition.com. Get Rockwell Nutrition designs for health detox whats needed by following the link. Yoga exercises helps a lot. I started not up to a month but, I can say it has done me well. I forgot to mention that I took neuroaid for two years. I did not suffer a stroke but a traumatic brain injury resulting in several issues stroke victims may also suffer from. My vision field was cut down to 60%. After a year I recovered from the other issues, personality changes, problems remembering words, and short term memory loss but my vision never improved. I was told by a prominent doctor that my vision loss was permanent and to learn to live with my vision loss. That was the worst thing I ever heard. I was devastated. After researching any option available I learned about Nova Vision. I am so grateful I found this therapy. I believe it is the only type in existence and if anyone has vision loss from a brain injury/stroke I hope they would try this. I followed the instructions and did the therapy at home for about a year. My vision is now 91%. There are two types of therapy. VRT and Neuro Eye Coach. I have done both and recommend both. VRT is FDA cleared and designed to restore vision loss due to neurological brain damage. The Neuro Eye Coach is a compensation therapy that re-trains the ability to make the most of the remaining vision, so even though I am not 100% after the training I feel that I am. I am a very independent person and I am very happy no one (except my doctors) can tell that I have any type of vision impairment. MusicGlove is a fun and effective rehabilitation device that helps restore hand function for individuals with stroke, spinal cord injury (SCI), traumatic brain injury (TBI), or other neurologic injuries. What makes the MusicGlove effective? 1. 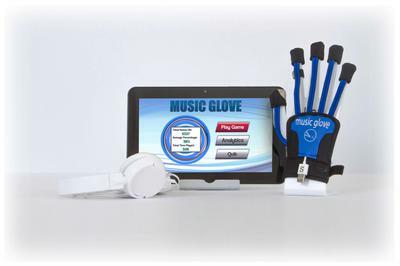 The MusicGlove provides direct feedback on your performance. This lets you easily track your gains over time and set goals for future sessions. These scores relate very strongly to established clinical measures of hand function. Meaning when you improve in the game, you are actually improving your hand function. 2. It’s portable! MusicGlove comes with a 10 inch portable tablet. The software is pre-installed. 3. The product involves music & game. This device breaks the monotony of typical therapy. The music is motivating medium to provide rehab at home. Ask your therapist about MusicGlove or visit their website for more information. Discover customer reviews, stories and learn about stroke prevention all through the MusicGlove Community. You learn to protect your head. You learn hand/eye coordination, strength training, and all the exercises (sit-ups, push ups, running, swimming, curls, jump rope, squats) are good for you, your core, and can be adapted. For balance you learn how to stand with one leg forward and the other leg behind you thus making you feel confident and not wobbly. It began in March of 2016, with a referral by Mary, my PT at the time, to Jefferey, a local Doctor who specializes in Botox treatments for many soft tissue problems. It was determined that I was a good candidate for Botox treatments for spasticity (or tone) in my right arm caused by a stroke. A program for a series of 4 shots at intervals of 16-18 weeks was started. At the beginning my fingers and wrist along with the lower part of my right fore arm were frozen. My only recovered digit was my thumb which came back after approximately two to three years. My index finger started to return at the beginning of my Botox treatments. Botox (of which there are 4 types) is essentially a poison. From a strictly non medical perspective, it is used to kill off the nerve endings that control extension or contraction of certain targeted muscles. There are 7 medically approved injection sites that a trained medical professional can select from in the upper limb. No more than 4 sites are chosen to inject at one session. This where you need to select a provider who can explain more fully the nuances of the work, and the risks that are involved. My progress to date has been a freer movement of previously restricted body parts (fingers wrist and hand). During the first three treatments, near the end of the 16 week spacing, nerve endings would regrow. The spasticity of the treated muscles would return. Now I am ready for my 4th round. The Botox (the effect of which subsides after the nerve endings killed by the Botox regrow) has been greatly reduced as the flexion muscles get stronger. I have a daily 4-6 hour routine of heat/passive and active stretching that I now follow. In the beginning this would not have been possible. Not being a medical professional,but a stroke survivor, I can only talk to my experience with Botox and a moderately impacted right arm from the elbow down. After 4 series of Botox treatments, coupled with physical therapy with an emphasis on my arm, it has taken a year in my case to decrease the tone or spasticity in my arm. The first observable change was in the reduction in the number of and severity of the contraction. I now have a marked difference in what would be called a clench fist and contraction of the forearm that keep the wrist pointed down. I do not belive that Botox on its own with out other help will single handedly solve or partially cure any affected body part. I am now on my 4th series of shots, received 8 instead of 6 and increased the dosage by one hundred units from 200 to 300. For the first time two shots were given above might right elbow, with the intention of addressing the tone in my elbow. It has been a week and the tone in that part of my lower upper arm and elbow has almost disappeared. Doing therapy and exercises to complement the Botox. In conjunction with botox injections, I have therapy to work on my affected arm hand and fingers. My expenditure of time averages 6-8 hrs a day of passive and active exercise. I have used Bands for stretching, a hand bike to keep joints moving, various size balls to stretch and and fingers and two splints (one resting or static and am getting a dynamic or moveable splint. Rehabbing any body part or system is a long slow process and requires determination and perseverance. 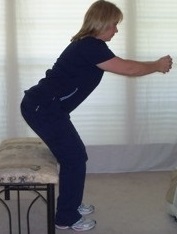 The total body exercise, combined with the stability provided in the seat, was Priceless! I have relapses, so this is a must have for my home. It quickly aids me in retraining my muscles, and helps to retard atrophy. The recumbent bike is a great option for many stroke patients! All needed is a piece of string and beads. Focus eyes on bead. 2 strings intersecting at bead should be seen. If strings don't cross at bead try blinking or crossing eyes then try again concentrating until they do.